Is it weird that Fall makes me feel like having a dinner party? I think it’s because Summer is a time to spend as much time outdoors as possible. Ss the days shorten and the chill falls, it just feels right to crank the oven on full blast and gather your loved ones around a table to break bread. I’ve been feeling the urge to have a dinner party lately, not in small part due to the fact that Pat and I have a new table. We’d previously had our eyes on a gorgeous farm-style table from a Canadian retailer, but couldn’t come to terms with the fact that it was made with wood farmed in Canada, then shipped to China for assembly, then shipped back to Canada and then to San Francisco where we would drop an obscene amount of money on it. We actually got it as far as our living room before realizing that such a purchase felt like spending blood money in some way, so anti-local and anti-eco friendly. Is it too dramatic to say I heard trees crying when I looked at it? Before that happened though, we sold our previous table, one that was near and dear to us as it had been refinished by my father, but one that just wasn’t quite big enough for my dreamy dinner party fantasies. That left us table-less for several months as we poured over Craiglist and even debated having one custom-made locally. By chance, I heard mention of Moveloot from a friend, a site I can best describe as a curated version of Craiglist. They started in San Francisco and only the second time I looked at the site I found the table. I literally couldn’t have custom made it any better – a bench on one side, enough room to comfortably seat 8 (plus!) and all for a third of the price our previous Canadian almost-purchase. In addition, because it was local and we were the second owners (yay recycling! ), we didn’t have to feel bad about the environmental impact. 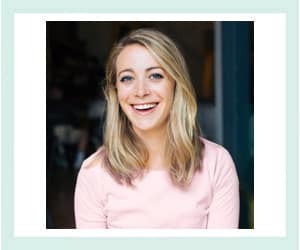 I’m not connected to Moveloot in any way, I should mention. It’s just a part of our table story. 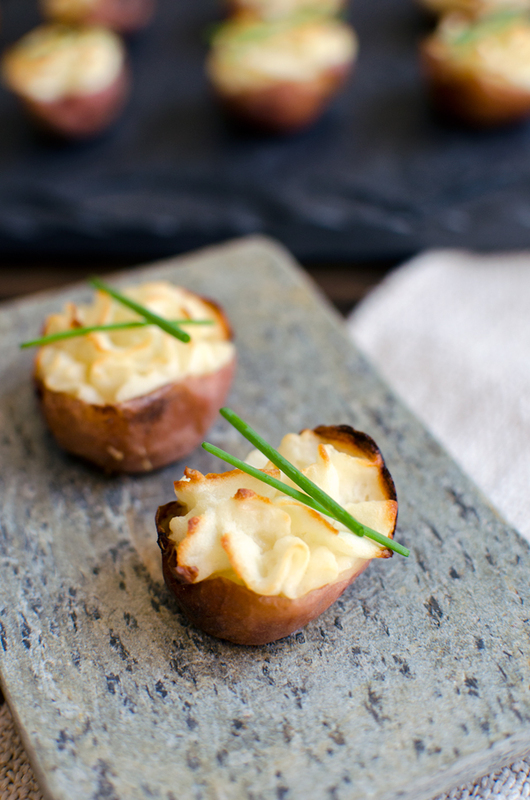 I made these mini twice baked potato appetizers with some of the little potatoes that came with our CSA last week. 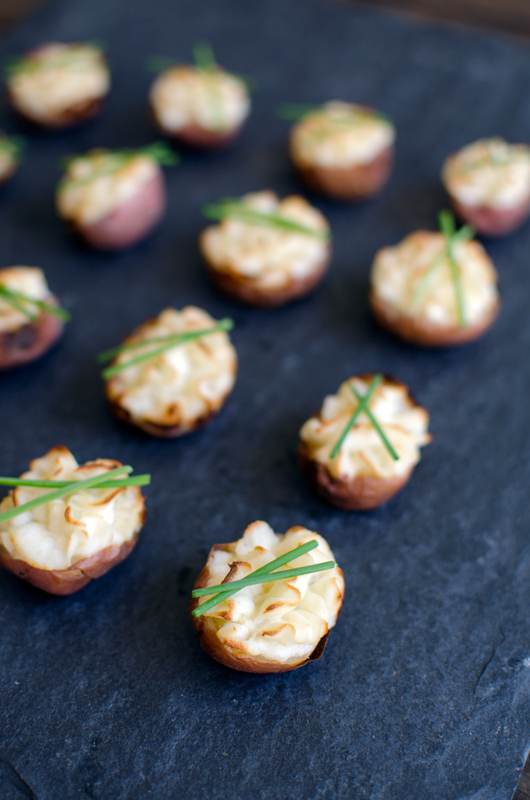 They are lightened up because they don’t have any added butter or cream in them – just a dab of goat cheese. They were so easy to make and are absolutely darling! I love that you can make them the night before and then bake them for the second time right before serving. Those who know me best know that I tend to overextend myself when I’m hosting a food-related event so anything I can accomplish the day before increases the chances that I’ll be able to actually spend time with my guests instead of rushing around the kitchen putting the finishing touches on the dozen dishes I’ve created. They have definitely earned a place at my next dinner party. 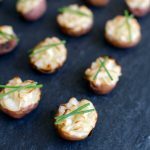 These bite-sized appetizers are a ton of fun, plus they’re healthier than usual twice baked potatoes as they are made with Greek yogurt! 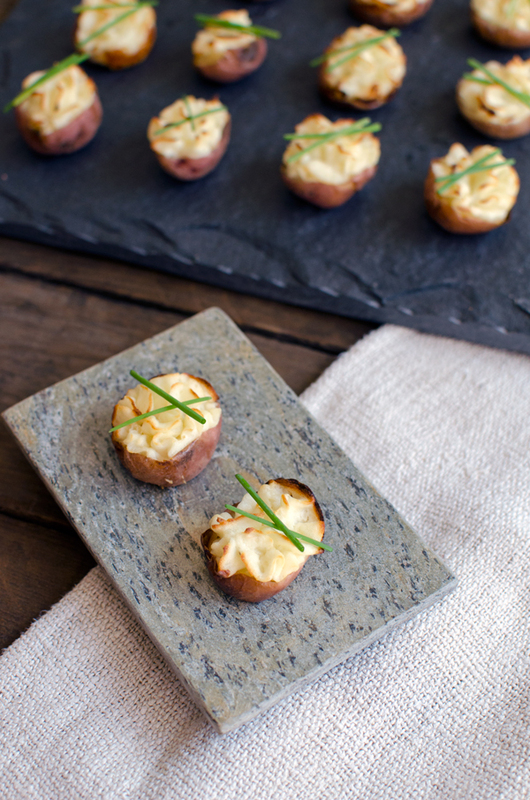 Place whole potatoes on a baking sheet and bake at 375F until very tender when pierced with a fork, about 30-45 minutes. 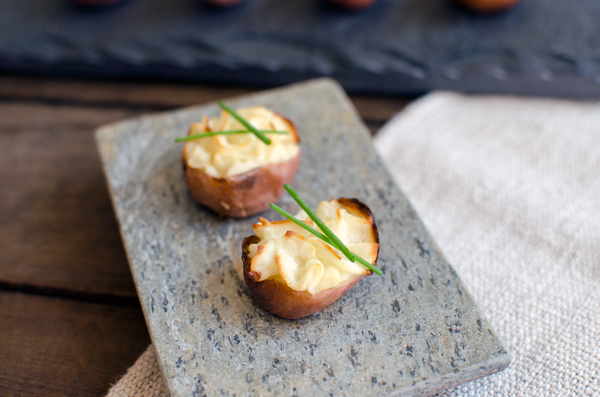 Being careful not to burn yourself, cut potatoes in half lengthwise. Scoop the potato flesh into a large bowl. I found that an espresso spoon was useful for this. Mix in the chevre, Greek yogurt, and salt and beat with an electric mixer until smooth. Spoon mixture into piping bags fitted with open star tip and pipe mixture into potato skins. You can also just spoon the mixture in using a small spoon. Happy Thursday, Kelly. These apps look delicious. I love hosting as well, but have been hesitant to do too much of it in my little city apartment. However, when my husband and I move to a bigger place, I’ll definitely be checking out Moveloot to get decked out.Thanks for the tip. Hey Ashley! No prob! I hear you about moving. We will be moving again in a few months so we have a few purchases that have been put on hold a well. Love these little bites! 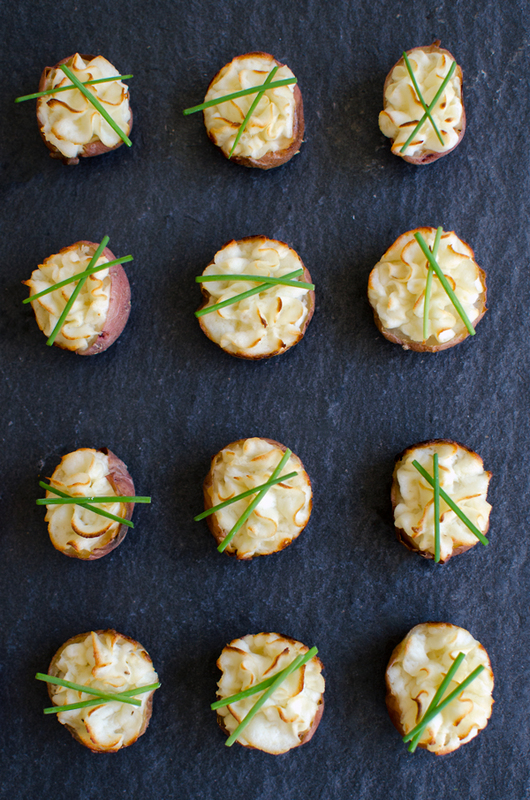 The piped potatoes are just the perfect touch.